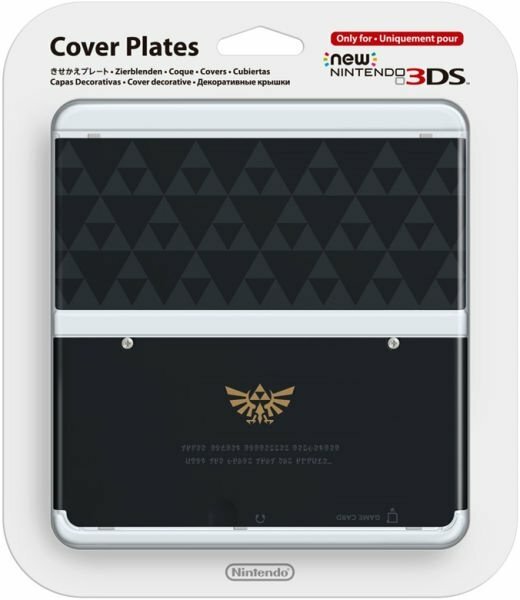 Not long ago UK New Nintendo 3DS owners were keen to grab the rather handsome cover plates for The Legend of Zelda from the official Nintendo UK store, with pre-orders rapidly selling out. As you can see in the images below they come in two varieties - a Majora's Mask 3D design and a more generic (but still lovely) Triforce theme. Unfortunately there seems to have been a pretty serious error with the Nintendo UK store - the online listings had the wrong series numbers attached to each product, and as a result a lot of 3DS owners have received the wrong cover plates - those that wanted the Majora's Mask version received the Triforce plates, and vice-versa. This has happened to multiple members of the Nintendo Life team, while we've received a number of tweets, while some have taken to Reddit. It's happened to plenty of orders, and while some are being offered replacements, others are only being offered refunds. The problem for the store is that both products are listed as Sold Out, so actually getting the correct stock to all that ordered them may not be easy. We contacted Nintendo UK earlier today but are yet to receive a response - we'll update this article should we hear back. Maybe some people could swap with other people that may have ordered and got the wrong plate two. People they know of course not random strangers that would be silly. This is like something that happens in a cartoon or something wow. Yeah nintendolife set up a swap forum. Be the hero! I would be happy either way if I got one. StreetPass UK should tell it's followers to swap at meetups. Peanut butter in chocolate or chocolate in peanut butter, one way or the next the Mr. Reese who brought both can't complain. I'm just glad I ordered both! They arrived today!!! Hahaha! That's pretty funny. However, If I had a small n3DS I would've prolly bought both, so I wouldn't have been affected. If I had to choose though, I'd say the Triforce ones are prettier. I like the more "low profile" simplistic design. Just another calamity. I wish Nintendo didn't partner with the hut group because they are useless. They sent my chargers separately when I ordered my two new 3DS consoles so I had the consoles with no chargers, the chargers arrived a few days later one on one day and another on another day. @JellySplat I agree with you, I think those complicated Skull Kid ones are pretty ugly. They'd Make a better instruction manual cover, or poster. Well they've ignored both my e-mail's about cancelling my entire wave 4 amiibo order. Let's see if they reply to Nintendolife about this! Are wave 4 amiibo available for preorder now!? Crap, I probably missed out on ALL of the ones I was looking at buying. Lucina and Robin will probably be going for some ungodly amount of money on eBay soon, sigh. @JellySplat Don't worry, this is regarding the UK preorders that were available back when the amiibo were announced. NoA have still said nothing about release dates so no preorders in the US. Oh, no I have no intention of buying a small n3DS, or plates to go with them. I'm in the US anyway. @JellySplat I was talking about was that wave 4 amiibo preorders went up for the UK around the same time as the New 3DS reveal. The US don't have wave 4 preorders yet because there's no release date. I have received both of my orders perfectly. There has been no mix up for me. But then again, I did order one of each of these cover plates. At least they got faceplates, unlike us. @Noxia the hut group are indeed terrible. They once sold me a "new" wii remote that was open (it fell out of the box as I opened it), missing it's usb charging cable and, crucially broken. At least they have a choice of which new 3ds they are want to buy. @Noxia I agree with you completely, however it is really weird as I have never had an issue with Nintendo UK Store. I sometimes get my pre-orders the day before release or on release date. I got the third wave of amiibo actually TWO days before release in February. Oh great, so most of the next shipment of stock will be used up to correct this balls up. Looks like I won't be getting one for a while. Actually I want both, so given the chance I would have ordered both and this problem wouldn't have even happened to me. Nintendo should ship the correct plates at no charge. Dunno why, but I'm laughing! I find this just plain hilarious! Thank the gods we in the US won't have problems like this. /sarcasm. "I'd rather not have any at all." Said no one in the US. EB Games already did this to me in the first batch of cover plates last year. Sent me the mushroom one when I ordered the Wooden Mario one (which costs 2.5x more.) If they do that to me again I won't be a happy customer. I can only hope Mighty Ape does a better job of sending the correct plates, mine are due to arrive on the 13th. @JellySplat Got to agree with you on that one, simplicity > detail in this case. 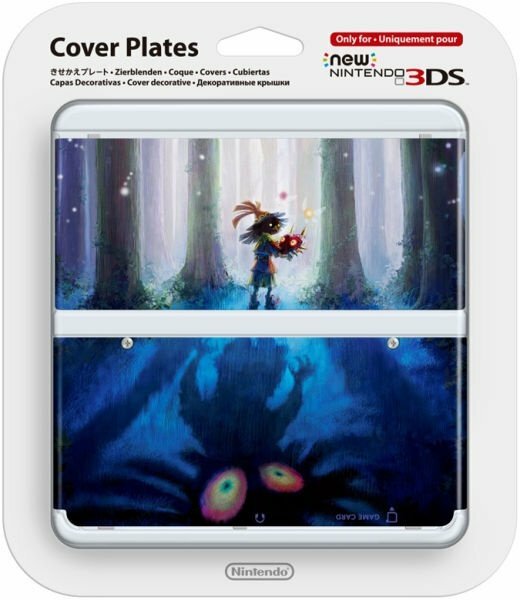 They probably should have easily distinguishable names as 'New Nintendo 3DS Cover Plates - Majoras Mask (White)' and 'New Nintendo 3DS Cover Plates - Majoras Mask (Black)' are just too similar. They could have just called the black ones 'Zelda triforce pattern' or something, they are actually probably related closer to A Link betwen worlds rather than Majora's Mask, I don't think the triforce is really mentioned in Majora's Mask (I could be wrong). What is it with Nintendo's naming department these days? What's the problem they are both great! Might need to set up a swap forum to sort this out! Just spoke to Customer Service. They're only offering refunds due to them being now out of stock. The guy I spoke to couldn't confirm a date for if/when they will be restocked. Tempted to just keep the wrong plate to save messing about with returning it. @MrGawain Can you not just log onto your nintendo.co.uk account and cancel the order yourself? I don't want it cancelled. I've already waited 2 months for it, and then suddenly they've cancelled the order without warning. I can't order them anywhere else because everywhere else is sold out. I sent them a message asking why, and they're refusing to reply. Scumbag customer service if you ask me. If anyone fancies doing a swap I have the black triforce cover plate and I want the Majora's mask skullkid cover plate for my son. We could move the trade to a forum with a feedback system. Yeah, the Triforce isn't mentioned at all in Majoras Mask. This problem could've been avoided so easily if someone who actually liked Zelda games was in charge of naming the products. Thankfully GAME.co.uk have it, used my points and got it for the same price free delivery. Woo! I've had numerous problems with Nintendo customer service myself, they're not as friendly and helpful as a lot of people here would have you believe. Remember when they were giving away free codes for Super Mario Bros DX on 3DS last year? I never received mine and I had to blitz them with 7 or 8 emails before they acknowledged there'd been a problem and sent me one....a full two months after everybody else had received theirs. At the start of the year, they also refused to add a free Zelda calendar (the promotion was spend £30, get a free calendar) to my existing preorder for amiibos saying that they couldn't make any changes to an existing order and that I had to delete the order and redo it in order to get the freebie....knowing full well that I couldn't as all the preorders for those amiibos had sold out (one of them was Rosalina and I had the next lot with Shulk and King Dedede preordered on the same ticket too). I've never heard of any company that can't edit your preorders before.....I'm pretty sure if I'd asked them to add a couple of Wii U consoles to my preorder they would have been quite happy to. Nintendo have now sent the correct ones at no extra charge. Still got the wrong ones though & Nintendo hasn't said what to do with them so I guess they are mine.